Echo Weave on 8 shafts on a warp of light blue and dark blue 10/2 cotton. 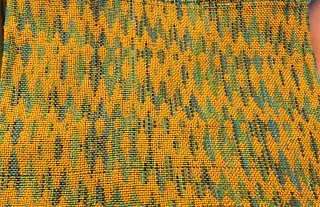 The weft is 20/2 cotton in golden orange. Woven by Virginia Lee. 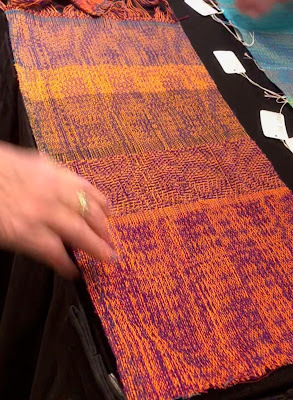 You've heard about Echo Weave, which is based on an extended parallel threading that weaves a warp-emphasis fabric with lots of color and strong patterns. But do you know about all the different structures you can weave on the same parallel threading? In addition to Echo, you can weave Turned Taquete, Shadow Weave, Rep Weave, Double Weave and even Collapse Weave, simply by changing your tieups and treadlings. Below is a photo essay showing some of the beautiful samples the folks in my workshop created, with brief descriptions for each. It was a visual feast! 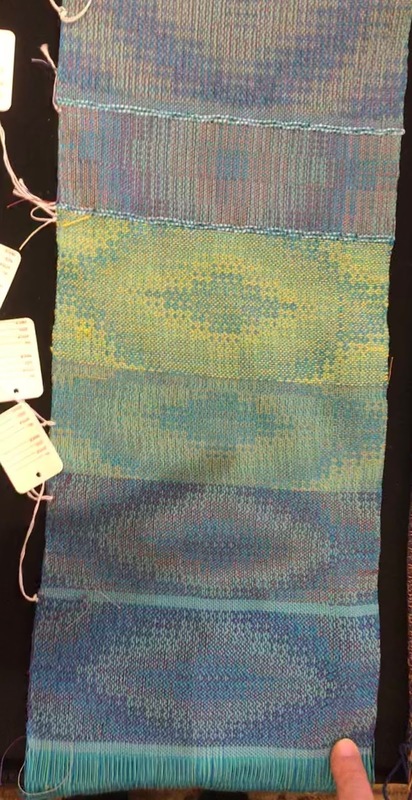 Above on left: Echo Weave sample using 8-shaft pattern, "Many Rivers," in light blue and off-white warp yarns. On right: the same pattern, this time in Double Weave, with top layer woven in off-white 10/2 cotton and bottom layer woven in 18/2 merino. The bottom layer fulls with hot water, soap, and agitation, making the top layer collapse and pucker. Woven by Roberta McKinney. Echo Weave in the 8-shaft pattern, "Falling Stars," using different colors of weft yarns in 20/2 cotton. 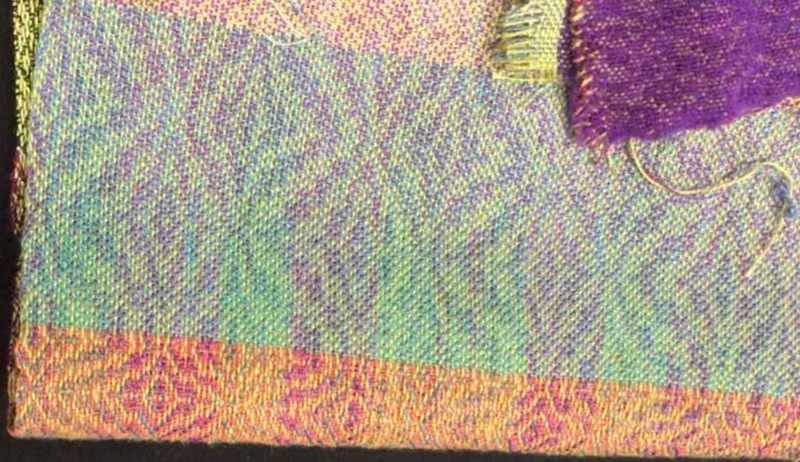 Note how the the weft color completely changes the color of the fabric. 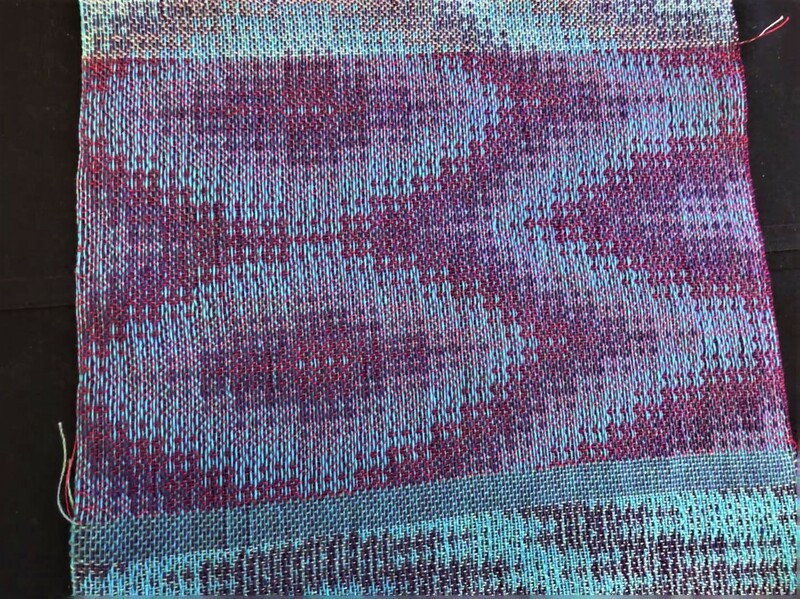 Woven by Teresa Edmisten. Left to right: Double Weave and Shadow Weave samples woven on 8 shafts in the "Fun House" pattern. 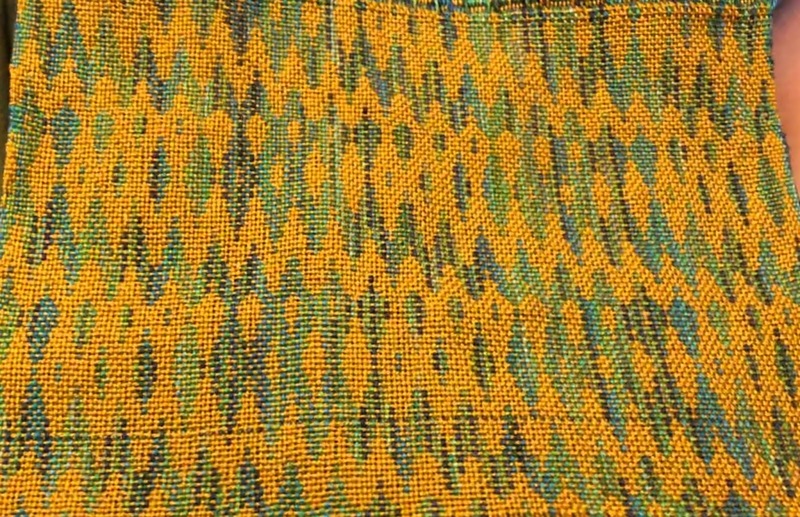 Double Weave, and Rep Weave on a 4-shaft pattern called "Op Art." Woven by Diana Abrell. Rep Weave in the "Fun House" pattern on 8 shafts. Woven by Virginia Lee. by Rachelle Weiss -- my apologies for not knowing for certain. The red weft creates the impression of 4 different colors in the fabric. Woven by Judith Rees. The two photos above: front and back of the "Falling Stars" pattern on 8 shafts in Double Weave. 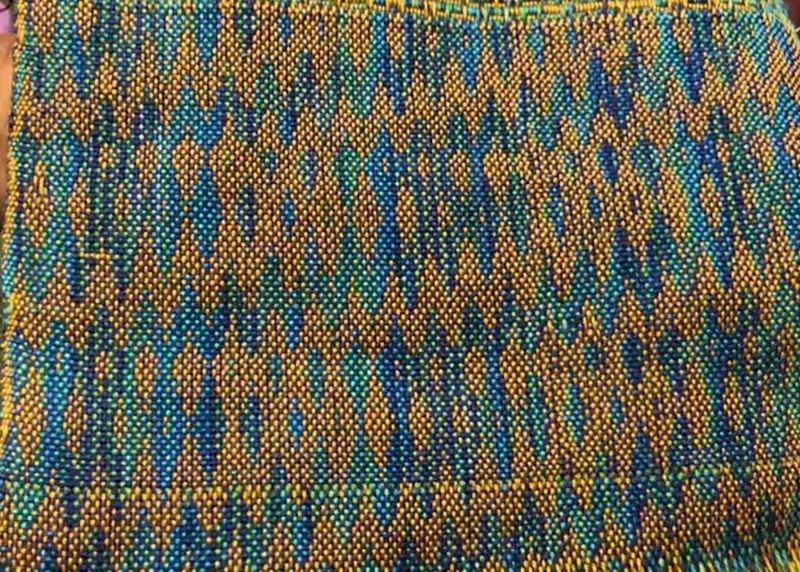 The warps alternate between a golden yellow and a hand-painted yarn in shades of green and blue. Woven by Sharlet Elms. The two photos above: front and back of Collapse Weave in the 8-shaft "Falling Stars" pattern, woven as Double Weave. 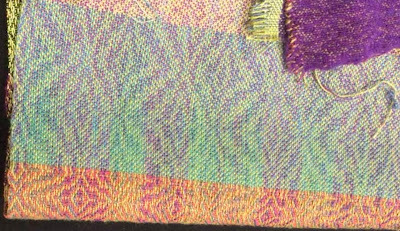 The weft alternates between 10/2 cotton in gold (front) and 18/2 merino in purple (back). With washing, soap, and a lot of agitation, the merino fulls on the back, making the layer on the top collapse into pleats. Woven by Sharlet Elms. Echo Weave, Shadow Weave, and Turned Taquete. 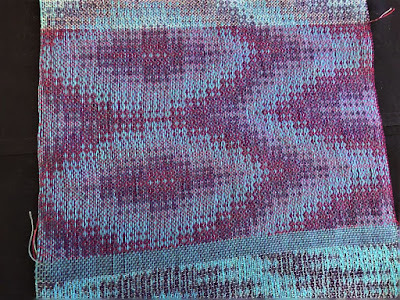 Woven by Virginia Glenn. Double Weave, Rep Weave, and again in Double Weave. 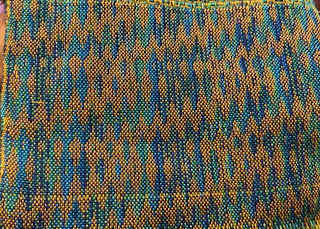 Woven by Ruth Ronan. Blooming Leaf pattern on 4 shafts woven as Turned Taquete. Woven by Sharolene Brunston. Above, top to bottom: "Fun House" pattern for 8 shafts. 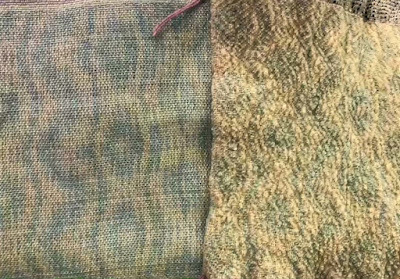 The top two samples are woven using a different Echo Weave tieup and treadling from the bottom 4 samples. The bottom 4 samples are all the same tieup and treadling for Echo, but using different colored wefts. The warp yarns are light blue and turquoise. Woven by Carie Kramer. Thanks for reading! And many thanks to the staff of HGA for putting together another wonderful gathering of the clan!